Mrs. Alice Jacoby of Cedar Grove, formerly of Dacada and Saukville, passed away Tuesday evening, August 23, 2016, in her garden at home. She was 78 years old. Alice was born on March 5, 1938 on the family farm near Little Kohler, daughter of Herman and Martha Biever Lubner. 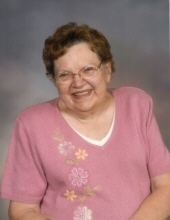 She attended local schools and graduated from Port Washington High School with the Class of 1955. On May 18, 1957 Alice was united in marriage with Roland Jacoby at Immaculate Conception Catholic Church in Saukville. The couple farmed on the family farm in the Town of Holland, and started their family. Mr. Jacoby preceded his wife in death on February 20, 1990. Alice worked at Allen Edmunds until retiring in 2004. She was a member of Our Lady of the Lakes Parish, St. Nicholas Chapel in Dacada, and enjoyed gardening, crafting, sewing, knitting and crocheting. She also was an avid domino player, belonging to two different weekly groups. Mrs. Jacoby is survived by her four children: Kristine (Steven) Hildebrand of Cedar Grove, Denise (Dennis) Dimmer, Lee (Kelly) Jacoby and Neal (Annette) Jacoby, all of Dacada. She is further survived by 11 grandchildren, 12 great-grandchildren, brothers Herman (Donna) Lubner of Port Washington and Mark (Bernice) Lubner of Fredonia. Other survivors include sisters-in-law Dolores (Donald) Schroeder of Cascade, Ruth (LeRoy) Meyer of Random Lake and Luella (the late Arno) Ansay of Belgium, nieces, nephews, other family and friends. She is preceded in death by her parents and her husband, Roland. A Mass of Christian Burial will be held at 10AM on Monday, August 29th, at Our Lady of the Lakes Parish, St, Nicholas Chapel, 4274 Hwy K , Dacada. Father Guy Gurath will preside. Alice will be laid to rest beside her husband in St. Nicholas Cemetery following the Mass. The family will receive visitors at the Eernisse Funeral Home, 171, N. Royal Ave. in Belgium on Sunday, August 28th from 3-6 pm and Monday at the church from 9-10AM, followed by mass. To send flowers or a remembrance gift to the family of Alice L. Jacoby, please visit our Tribute Store. "Email Address" would like to share the life celebration of Alice L. Jacoby. Click on the "link" to go to share a favorite memory or leave a condolence message for the family.